The misdirection is based on the false assumption that only a few variables and mechanisms are important in climate change, and they remain constant over the 4.54 billion years. Two major themes of the AGW claims are that temperature change is greater and more rapid than at any time in the past. This is false, as a cursory look at any longer record demonstrates. If it wasn’t, the actions taken to change the record are unnecessary. The Antarctic and Greenland ice core records both illustrate the extent of temperature change in short time periods. Figure 1 shows a modified Antarctic ice core record. 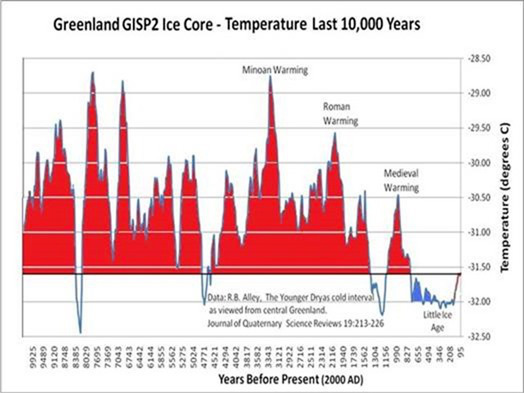 The last 120 years, the period during which we have thermometer records for a small portion of the Earth’s surface, is more or less invisible at the far right edge of the graph. The total temperature range is approximately 12°C (-9°C to +3°C). The variability is dramatic even though a 70–year smoothing average was applied. Steve Goreham shows how small a portion [the last 120 years] is in this diagram of the last 10,000 years (Figure 2). Another graph shows the same period, the Holocene Optimum, in a different form (Figure 3). The temperature range in this period is approximately 3.75°C (28.75 to 32.5°C) but is above the current annual average global temperature for most of the 10,000 years. Just put the approximately 120-years of instrumental record in any segment of the graph and you see how it is cooler than most of the period and well within natural variability. There is much more, but in my opinion a basic understanding of the huge natural variability in the climate, and the relative insignificance of the modest rise in temperature that occurred in the late 20th century, is fatal to global warming alarmism.